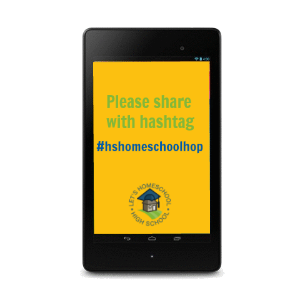 Welcome to the 2014/2015 High School Blog Hop at LetsHSHS.com! Each month in the coming school year, we will be hopping around some of the web’s best and brightest high school homeschooling blogs to share tips, resources, and encouragement on all things high school homeschooling! Thankfully, homeschoolers aren’t shy – – we LIKE sharing! So, please join us on our journey, and maybe even hop right along with us!!! Use the Linky Tool in the monthly blog hop post to link up your blog. THEN, share the code on your own post to become a blog hop co-host! Once you’ve linked up your blog, we’d really appreciate it if you would grab our LET’S HOMESCHOOL HIGH SCHOOL button for your sidebar & enjoy making new high school homeschool friends!